If you’re looking for pedigree, it doesn’t really come much stronger than this. Directed by the man who helmed the Metroid Prime trilogy. Written by the man who helped build the Halo universe. And with the involvement of an outspoken Japanese development legend who’s never far away from the headlines. So why aren’t more people getting excited about Windows 10 and Xbox One exclusive ReCore? Perhaps it’s the less than stellar reputation of Comcept, the Japanese studio headed up by Mega Man creator Keiji Inafune, most recently responsible for the troubled Mighty No. 9. 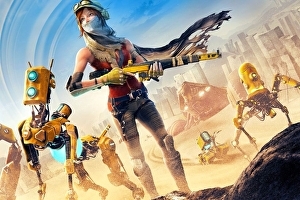 Maybe it’s the price point – ReCore will be coming in at £29.99, undercutting its competition by some margin – giving rise to a perception of it as something of a budget game.